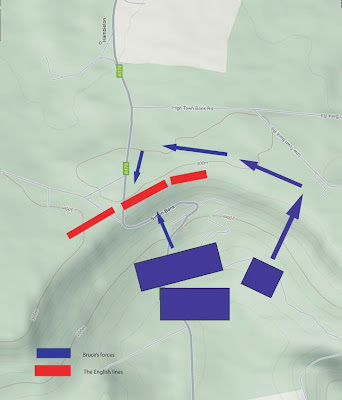 Finally – I’ve managed to put together this post on Battle of Byland itself – it feels like it has taken forever – mainly because I had to translate a source from the original Lowland Scots language as well as draw up the battle plan! Someone (Carla) asked me how I make the maps. Well, first I take an original map image (credit to Google Maps in this case), manipulate it so that it is the right size, rotation etc (this one was rotated 90 degrees to make it easier to appeciate the gradients) and then I add anything else – such as battlelines, arrows etc – in Adobe Illustrator. As I’m not that familiar with the package, it does take some trial and error, but I hope that it has the effect of making everything a bit clearer. Thanks to Kathryn Warner for allowing me to use her photos of Sutton Bank. As usual, the photos will come up larger if you click on them. North Allerton was less than five miles from Rievaulx, as the crow flies, although to reach Edward the Scottish forces would have to make their way upwards onto the moors. Despite such short notice, the Earl of Pembroke managed to reach the royal army (or what there was of it) and they took up a defensive position. Andrew de Harclay, who had also been summoned, for some reason didn’t make it: his absence was to have grave repercussions not only for Edward for also for himself in the future. The exact location of the battle is uncertain, although it was somewhere around Old Byland (not Byland Abbey). Modern historians Professor Barrow and I. M. Davis have placed it at Sutton Bank, an escarpment not far from Byland and after a consideration of the accounts I tend to agree. Most accounts of the battle by English chroniclers are rather sparse – as you would expect considering the outcome. However, a much fuller version is given in the near-contemporary poem The Brus by John Barbour – a Scottish poet who was born around 1320 and died in 1395. His patron was Robert II, grandson of Robert the Bruce through his daughter, Marjorie. He was also the nephew of Robert Bruce’s son and the last of the Bruce male line, David II. As expected, Barbour’s The Brus, written around 1377, was more or less an homage to Robert Bruce’s greatness and so does suffer from a few exaggerations, errors and patriotic sentiments. But for all that, it is also agreed that the poem is more truthful than other, similar homages – and Barbour must surely have heard stories of the battle, either from those that were there or there descendants. Therefore I have used Barbour’s version, for the most part, in recreating what happened at Sutton Bank on the morning of the 14th October 1322. It seems that, the night before, the Scots had performed a night march from their position at North Allerton, hoping to surprise the English. 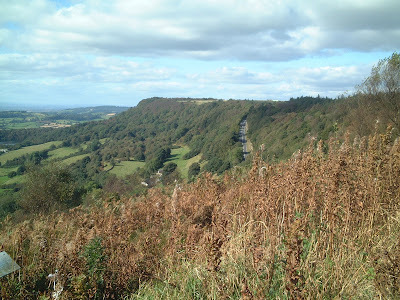 Instead they met with a steep escarpment, known today as Sutton Bank. The English must have been alerted to their night-time movements for the English forces – under the banners of the earl of Richmond, Henry Beaumont and the earl of Pembroke, had already moved forward from their base at Byland (and here, I’m assuming it is the village of Old Byland, not the abbey – which wouldn’t geographically make sense) to hold the ridge and the one path that led to its summit (possibly the same route as the A170 takes today). 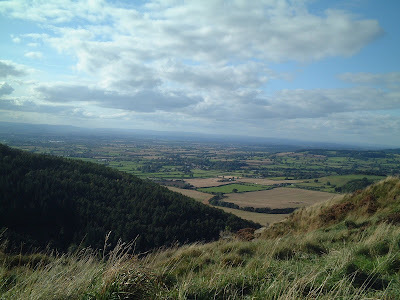 The view West (towards Thirsk) from the summit of the escarpment. It gives a good impression of the height. 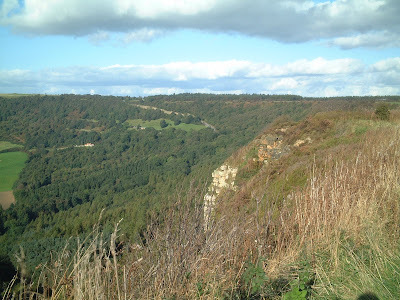 Bruce was now faced with a choice: either to attempt the difficult task of fighting up what was more or less a cliff and taking the ridge, or else a 15 mile march around it to Helmsley, where it would be easier to reach Rievaulx. Of course, if they did that, Edward would have had plenty of time to escape. So Bruce made a pretty brave decision and sent James Douglas and his men to assault the path. Not wanting to be left out of the action, the earl of Moray, together with four of his men, also volunteered to be in the vanguard. Sir James welcomed him warmly and together they led the fierce fighting up the slope. Arrows flew and rocks were hurled down upon the Scots by the English men. Two English knights in particular, fought so valiantly that they were named in the poem: Sir Thomas Ughtred and Sir Ralph Cobham. Ralph Cobham was considered to be the best knight in England, according to Barbour – but at this attack he was outshone by Ughtred who held his ground for longer, although he was then, unfortunately, captured by the Scots. Sutton Bank again, from the Roulston Scar end – the sort of place the Highlanders may have attempted the climb to get around the rear of the Engish line. While the English were thus engaged on the ridge and path, Bruce sent men from the Highlands to find a way up the cliffs to one side of the battle. Being more than accustomed to scrambling about in such territory, the force soon scaled the escarpment, outflanked the English and smashed into their rear – just as a sudden push forward by Douglas and his men captured the heights from in front. Seeing the turn of events, some of the English soldiers fled while the rest fought on bravely and futilely, either being slain or captured. Among the high-ranking prisoners were John of Brittany, the earl of Richmond, Henry de Beaumont and a French knight, the Lord Sully. Robert had an especial dislike for Richmond as he considered him a war-monger and it is said that the Bruce gave the earl a public dressing down. Later, Sully and a couple of other French knights were released without ransom as a sign of favour and friendship towards the French king. Once the Scots had taken the heights at Sutton Bank, Sir Walter Steward and his cavalry swept past the remnants of the battle and headed straight for where they thought Edward II was staying, intent on capturing him as well. The poem makes it clear that he was at Byland (the village, not the abbey), although other historians place him still at Rievaulx. But wherever he was he must have heard of the English defeat almost as the Scottish cavalry were bearing down on him. There must have been a complete panic for him to escape as he left behind all of his possessions, armour and even his privy seal – all of which was captured with great delight by Bruce’s men. Finding Edward gone, Steward turned his horses towards York, obviously thinking that Edward had gone that way. Upon reaching the city gates, he and his men issued a challenge to any who would come out and fight them. Of course, no-one was so stupid as to accept (there probably weren’t that many fighting men left in the city at that time anyway), so Steward turned and rode back to join the rest of the Scots who were ransacking Rievaulx and Byland Abbeys before settling down there for the night. Edward, meanwhile (and we must assume, Hugh as well) had taken a more circuitous route from Rievaulx, going first to Bridlington on the coast (see the map in the last post). Maybe he had hoped to find a ship there to take him to safety. But it seems that none were to be had. The next day, flushed with their victory and knowing that no-one would stop them, Bruce’s men continued into the Wold, plundering and destroying the countryside as far as Beverley. Whether they knew Edward was nearby is impossible to know – probably not as they do not seem to have been searching for him. But their presence had the effect of forcing Edward to flee even further south – to Burstwick, before cautiously making his way north and west again to arrive at the archbishop’s palace at Cawood on the 23rd October and entering York itself on the 24th. By this time, Bruce had enough plunder, livestock and prisoners and was making his way back, unchecked, into Scotland. The Battle of Byland had been a humiliating – and probably completely unexpected – defeat for Edward. After all, not many armies would attempt an attack up such a steep slope, let alone succeed. But once again he had underestimated Bruce’s brilliance as a tactician and commander – skills which Edward, and seemingly his barons, sadly lacked. One of the fallouts from the defeat was that the earl of Carlisle, Andrew de Harclay, realised that Edward could never defeat Bruce and so went ahead and negotiated a truce between England and Scotland without Edward’s knowledge or consent. Although it was probably the most sensible and practical thing to do in the circumstances, it was also treasonable. An incandescent Edward ordered de Harclay’s arrest, soon followed by the traitor’s death of hanging, drawing and quartering in his very own city of Carlisle. Tagged Andrew de Harclay, Battle of Byland, Byland Abbey, Edward II, Rievaulx Abbey, Robert Bruce, Sutton Bank, Yorkshire. Bookmark the permalink. I love that you so often include photos!! Excellent account. Gabriele has the rights of it; Highland troops in particular were accustomed to steep and rough terrain. They probably felt right at home on the North York Moors. Meticulous rerearch and a fascinating read! Thank you, Lady D, for all your hard work in putting together such terrific posts about the battle of Byland. It's not often these days – almost never, in fact – that I feel like I learn something about Ed II and his reign, but I genuinely did here and in your previous posts on the battle. I understand it much better now! As you said to pin point the battle site is difficult but did you look at the area above Oldstead There are two interesting areas called – Hell Holes and Scotch Corner could this be linked to the battle ? I didn’t explore that area at all, so can’t really say what I think, but I know that there is one site on the Internet (http://www.darlingtonandstocktontimes.co.uk/news/991369.Rediscovering_the_lonely_site_of_the_Battle_of_Scotch_Corner/ that thinks that Scotch Corner might be teh site of the Battle of Byland. I’m afraid I’m not sure where Hell Holes is. When I next go up that way, I’ll have a look and see if it fits with the literature, although I must say that Sutton Bank is pretty good in that regard. If you hear of anything else about these sites (such as anything being dug up), please let me know. Thanks for the information.